Stone International during the middle of ninety introduced in the Italian and European Market the stamped concrete and to day became the leading company in this trade. The stamped concrete is a system that, by making use of concrete as base material properly dosed, elaborates, introduces additives, colors, models, rivets and seals it until it obtains a final pavement having the following characteristics. Sidewalks, streets, yards ,open area, walkways, show rooms, ramps, garages, parking area, swimming pools borders, riding floors, remodeling of historic town canters. Because of the big choices of colors and models and for the low costs , the stamped concrete became as time went by always more popular. 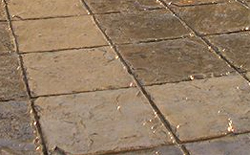 The stamped concrete can be employed with other similar elements as the Stone Acid Stain. The stamped concrete can be applied also on existing concrete surfaces with a minimum thickness available (7 up to 25 mm ) using the Stone Overlay System.